Need It Done Right The First Time? We offer residential service in the DFW area. Our residential service teams are fully licensed and professionally trained to tackle even the toughest problems. We specialize in electrical commercial service work in the DFW area. We also offer new electrical construction services and electrical design/build services. Our business is a Woman/Minority-Owned (W/MBE) and HUB Certified. We specialize in government service contracts and new construction projects that require minority participation. Fort Worth Electric is a Better Business accredited business with an A+ rating. To view our profile click here. 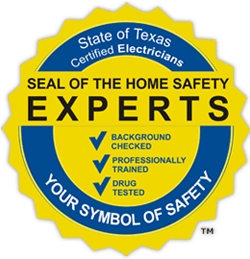 Our Technicians are background checked, drug tested, and Professionally trained. Let us take care of your parking lot lighting! We offer 1-time pole light and building lighting repairs or for a more hands off / time-saving approach, talk to us about our quarterly lighting maintenance agreements. Plagued by power failures or just want to be ready when the power goes out from a storm? Standby Generators offer critical power when you need it most. Have peace knowing you don't have to wait hours and hours for Oncor to turn your lights back on. We offer residential standby generators and commercial standby generators. Stop equipment failures in their tracks! Thermal imaging allows us to inspect electrical equipment for surface hot spots that could lead to failure. Schedule equipment repairs with us on your own time instead of when the equipment fails at random. Do you have important equipment you don't want damage from a power surge? We offer surge protection services for residential and commercial applications.